Better student behavior not only results in better outcomes for students. It also means a better day for teachers and administrators. Find out how Behavior Manager helps make it happen. are not going to pass! Students who miss class time being tardy, absent or out-of-placement (suspension, expulsion or alternative school), are at greater risk for failure. Schools need to reduce time out of class to foster student achievement. Consider a tardy student, five minutes late to class. Do you send her to the office to return twenty minutes late for class? Or is it better for the teacher to record a 1-click tardy which automatically assigns an intervention or consequence which the student sees on her phone? And what about a frequently tardy student? Do consequences (punishments) continue to escalate up to suspension or expulsion? Isn't it better to recognize the developing power struggle and finesse it with an intervention like Check In/Check Out? Which approaches work best for keeping the student in class and learning? Behavior Manager is used to support a variety of approaches to improve student behavior including Positive Behavior Interventions and Supports (PBIS), Restorative Discipline, Loss of Privilege, Restitution and Reflection. Recognize appropriate behavior. Catch students being good. Consistently enforce rules with follow-through. Avoid power struggles in the classroom. Quick response by administrators to classroom problems can keep teachers teaching and learners learning. Avoid power struggles in consequences. Offering students choices (e.g., serve detention any day by next Friday) lets students take responsibility for their consequences and avoids conflict over specific assignments. Apply judgement to consequences. Good judgement requires good information. Have the facts of a student's history, including teachers' notes and incident histories, available at a glance when assigning consequences, especially including such things as behavior plans. Keep faculty informed. Faculty must have confidence that administrative action will be prompt and effective. The best way to build that confidence is to notify them when consequences are assigned and served. Enlist parental participation. Make parents partners in student behavior and achievement by keeping them informed of incidents at school. Let them know about accomplishments as well as behavior incidents. Catch behavior problems early before they escalate to out-of-placement consequences. Students stay in class. Respond quickly to classroom issues. When administrators get real time notifications of classroom behavior issues, they can respond by going to the classroom rather than having the student sent to the office. Students stay in class. Share thorough student histories with parents. Parents get a clear idea of what happens at school. Parents become allies in the mission to keep students in class. Make out-of-placement time as beneficial as possible. If a student must be placed in in-school suspension, make that time as beneficial as possible by making it easy for teachers to provide assignments for students to work on. Also, make it easy for the in-school suspension teacher to know which assignments have been received and which have not. How does Behavior Manager save your time while making you more effective? 1. Automation: We do the work for you. Behavior Manager keeps track of merits and rewards, notifies parents of infractions, keeps track of parent communications, assigns appropriate interventions, creates intervention rosters, tracks whether consequences have been fulfilled, collects assignments for students out of placement, distributes info to the student and parent portal. 2. Power Tools: We help you understand your data. Behavior Manager helps you analyze and make decisions with powerful and flexible data queries and informative charts, compares current performance to past performance with analytics tools, sets monitors, customizes notifications, enables peer behavior monitoring, offers just-in-time training for teachers on relevant behavior issues. 3. Breakthoughs: We help you do better in less time. Behavior Manager helps you save the most time and be the most effective by helping you change to a positive, cooperative school culture if you choose to. Teach the behaviors for success: expectations, rules and procedures. Emphasize positive feedback over negative feedback. Build professional personal relationships with students. Use the data for data-based decisionmaking. Use tools for setting goals and data queries for scheduled progress and adjustment reviews. Help struggling teachers to master effective classroom management skills with our deliberate practice tool. Replace out-of-placement consequences with more effective interventions. We have helped schools use breakthrough practices to turnaround seriously challenged schools. Prevention works better than problem response. Punishment has a big advantage: it's quick and easy. But it has disadvantages: it fosters resentment, often removes the student from the classroom and from learning and tends to be ineffective at improving student behavior. That's the advantage of positive behavior interventions and supports (PBIS): teaching expectations then shaping behavior with positive feedback and keeping students in class. But that puts a bigger burden on teachers. Penalties for misbehavior aren't eliminated, but they are needed less frequently. And research has shown that a mixed approach of "carrots" and "sticks" works better than either alone. We provide the tools to support both, PBIS and mild punishments...what we call balanced PBIS. And our positive behavior tools are designed to minimize added burden on teachers so they can focus on instruction. Some students require a lot more attention and intervention than others. The solution: better tools for better focused attention. The 3-tier framework simplifies the task by grouping students according to the behavior attention they need. 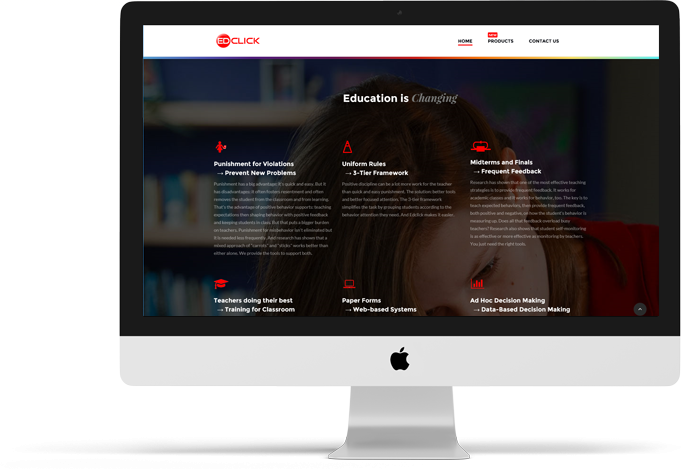 And Edclick makes it easier. Research has shown that one of the most effective teaching strategies is to provide frequent feedback. It works for academic classes and it works for behavior, too. The key is to teach expected behaviors, then provide frequent feedback, both encouragement and correction, on how the student's behavior is measuring up. Does all that feedback overload busy teachers? Research also shows that student self-monitoring is as effective, or more effective, as monitoring by teachers. You just need the right tools. Classroom management is typically not taught in ed school yet the stress of unruly students is a frequent reason for teachers leaving the profession. And it means lower student achievement. Most teachers manage their classrooms well but some need more help and a few need a lot more help. The 3-tier framework applies to teaching teacher skills, too. It simplifies the administrator's job. Edclick's just-in-time training is based on the issues a teacher is facing in the classroom right now as revealed by collected data. Our self-monitored skill practice is tied to day-to-day experience in the teacher's own classroom. Most documentation in most schools is still done on paper. With ubiquitous laptops, tablets and smartphones information collection is easier, faster, more effective and more efficient. Moving online brings a wealth of new opportunities based on access, aggregation, visualization and manipulation of collected data. A cornerstone of PBIS is to apply data to decisionmaking. With data going online where it can be easily accessed, viewed and manipulated, we no longer need to make decisions solely on hunches. Available data, reporting, drill downs and dashboards make trends, status and problem areas easy to see. And when we take steps to improve, data answers the question, "did it work?" Integrated data systems bring together data from disparate systems (the data silos) to save work and eliminate transcription errors. Our data systems talk to other data systems you may already be using. We all want parents as partners in their child's education. But how can we accomplish that without putting even more burden on teachers? First, Edclick makes some communication automatic such as when a student gets a merit award or an office referral. But it also can notify parents when nothing happens such as automatically notifying parents of the good news of a problem-free day after a series of incidents. We also keep track of the types of communication with parents so teachers and administrators have evidence of the ratio of positive messages to negative messages which is essential for getting parents and teachers on the same side. Break the school-to-jail pipeline that looms over the most challenging students. Punishment is quick but often generates student resentment, not the desire or skills to behave better. Out-of-placement punishments reduce student achievement: if they aren't in class, they won't pass. But serious misbehavior requires a serious response. Yet, that doesn't mean that the student must resent the consequence or that the student must miss class. 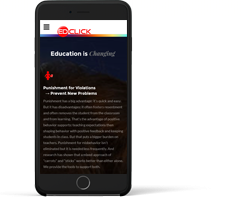 Edclick provides for more effective consequences. Restorative justice and restitution aim to "make it right" rather than simply punish. Student responses to our Behavior Questionnaires and Character Builders often reveal root causes for misbehavior which can then be addressed. Check In/Check Out can give a student the attention he craves but through frequent feedback instead of misbehavior. ... to hear an amazing story? Laptop at your desk? Working the class with a tablet? Roaming the halls with a smartphone? We can support you where you are when you need us. And the same goes for students and parents on the go. We work with the companies that have established a stainless reputation in what they do. They are leaders in various spheres of business, and we appreciate cooperating with them.